This is a great looking dress, it suits you well. 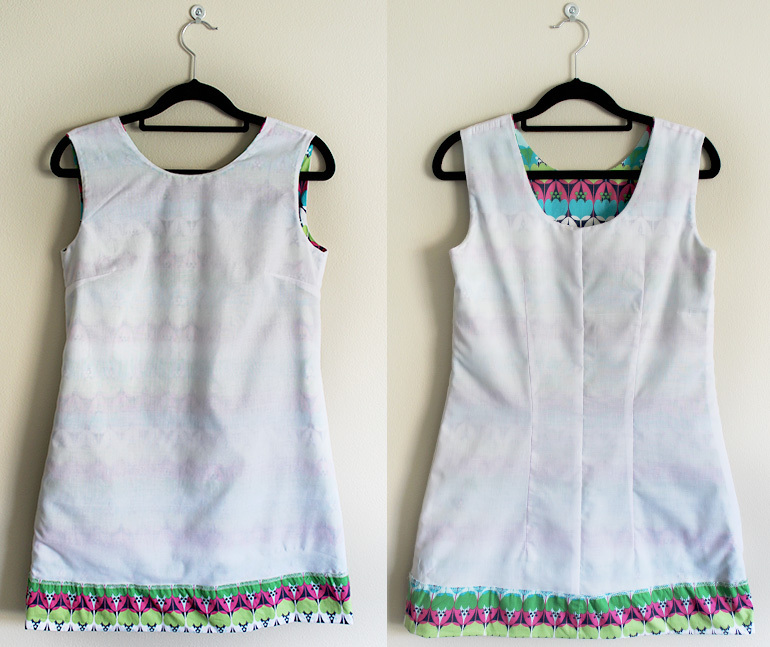 I have some material that I am thinking will make a perfect shift dress, one of my many favorite styles, and I am totally interested in a shift dress lining tutorial. I am gonna have to line the one I want to make and the pattern doesn’t have instructions for it. Thanks! Great. I took pictures of the process so I will post a tutorial :). Yay! 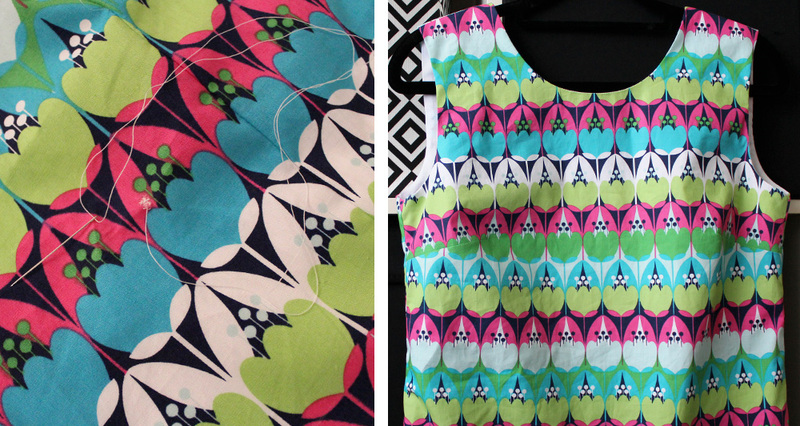 Linings are often much nicer to work with than facings, look forward to seeing your shift dress! Cute dress! Your lining technique is definitely intriguing. Glad to hear you’ve found your Holy Grail pattern! 🙂 Looking forward to lots more lovely shift dresses from you! I’m definitely interested in hearing more about your lining technique – the inside of this dress looks great. LOVE!!! Cutest dress ever! The fact that it doesn’t have a zipper and is just a slip on makes it even better! Yes, you should do a tutorial. I am still in the fear stage of linings. Thank you! so glad you like it :D! Yay! I will do one! I know what you mean, they can be so confusing! It’s gorgeous! Daughter No2 really loves your style! Oh, cute! 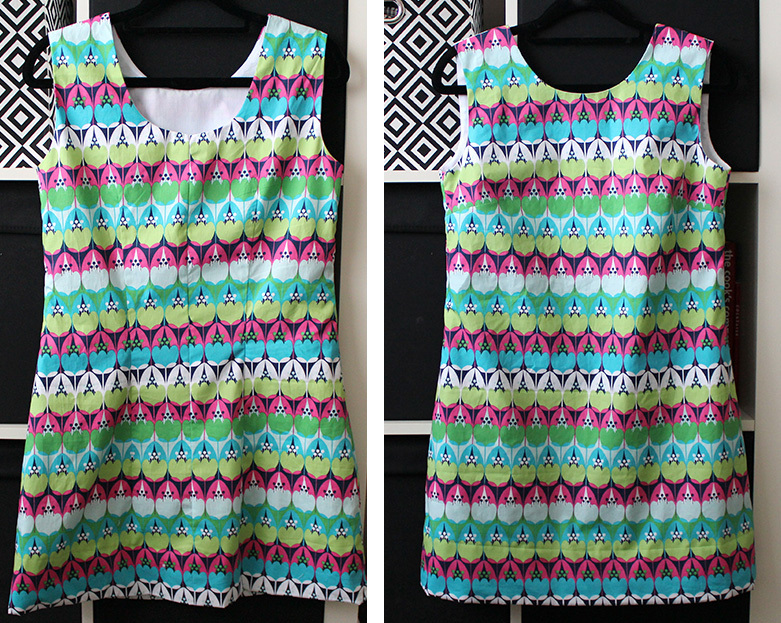 I love a patterned shift dress and one without a zip sounds good to me. I’d be interested in a lining tutorial. I just saw your latest dress with the tribal print, it is absolutely beautiful! So glad you think it will be helpful! Lovely not to deal with zips once in a while! Printed shift dresses suit you, and you have an eye for fabric. This one is so pretty! Thanks so much Kat 🙂 I love your style, so that means a lot! I love this! It’s so happy! I love the scoop neck in the back, too- gotta love skipping a fastener! I like a nice deep hem on a shift dress, too. It gives it a great weight! You are too cute!! This style of dress was made for you! Cute! Shame about the hole but thankfully with your print it’s not that noticeable. Took me a while to spot it in the photo!